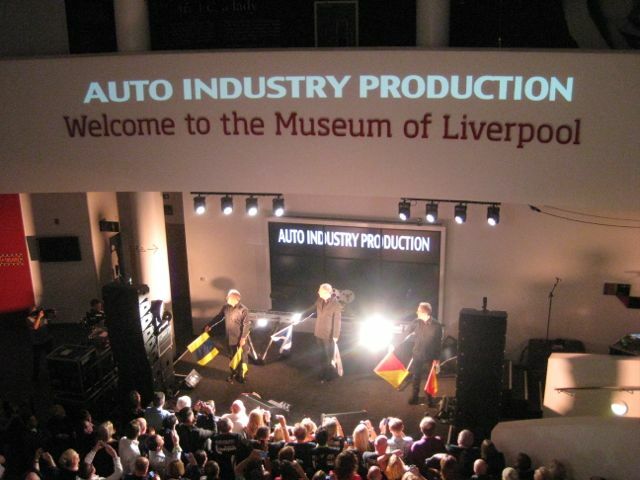 The Museum Of Liverpool performance, which took place in October 2014, marked a very special event in OMD’s concert history. The combination of an installation art piece, newly released OMD music, Dazzle-themed films and finally an intimate OMD concert made for a very special weekend. With the news that the concerts were being filmed it also meant that some of that special atmosphere could be preserved for posterity. For OMD, this marked an unusual event as the band have traditionally shied away from dabbling in the world of live performances. Perhaps the most obvious exception to that rule was the classic Live at the Theatre Royal Drury Lane video from 1982. This performance, filmed during the original Architecture & Morality tour, caught the band at the height of their powers. 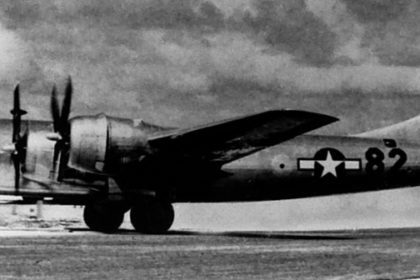 Even so, despite their agreement to release a live video, there were concerns from the band about the quality of the performance. This resulted in some of the singing in the video being overdubbed (if you’re observant, you can see segments of the video where the audio and video don’t quite match up). OMD’s tours in these early years had a very strong visual element to them, notably through the desire to translate Peter Saville’s design concepts to a stage environment. As a result, the Drury Lane recording set a template of sorts for the way forward. In both 1983 and 1984, the band arranged for the filming of Dazzle Ships and Junk Culture performances. 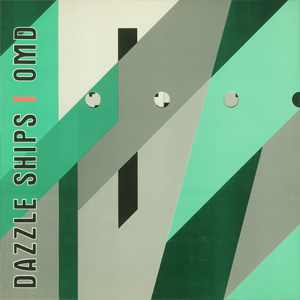 Capturing the stunning stage designs of Dazzle Ships alone meant this was an important visual record for the band. However, the footage of both of these unique performances has been subsequently lost leaving not just one, but two Holy Grails lurking in storage out there (hopefully) somewhere. In 1985 the band were featured in the BBC1 music series Oxford Road Show. In a special programme, the band were the focus with a filmed performance taken from the Crush tour in Sheffield. Meanwhile, the show was interspersed with interviews from a variety of characters from OMD’s past, including Julia Kneale. 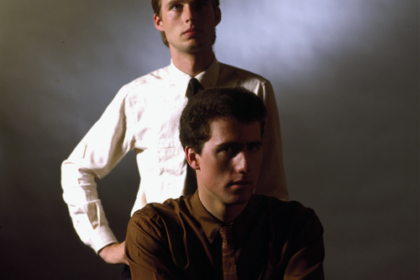 Although not an official release, the TV show captured OMD during their mid-career period and copies of the performance are eagerly sought after by OMD fans. Despite their high profile appearance on the BBC, the band had largely distanced themselves from live recording work at this stage. On occasion, they would drop in recordings as B-sides to single releases although this was more desperation due to shortage of material than an artistic statement! 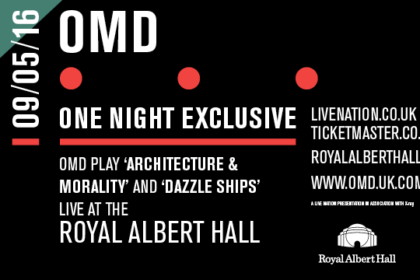 Uncannily enough, OMD would return to Architecture & Morality when they came to revisit the idea of filmed concerts. 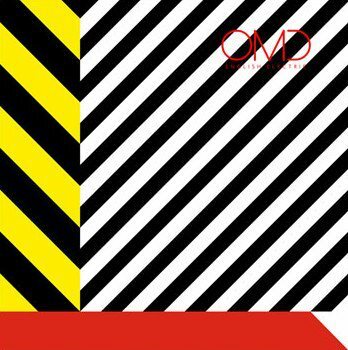 2008 saw the release of OMD Live: Architecture & Morality & More, which debuted as both a DVD and also a live album, which also marked OMD’s first official live album release (this would be followed up by the band’s 2011 Live In Berlin release). 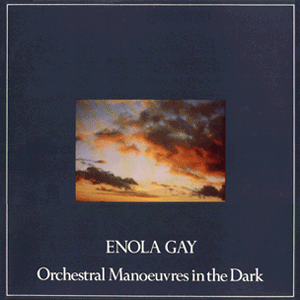 Although the recording captured a revitalized OMD who had just reformed, there were grumbles behind the scenes about the editing and choices of shots for the final release. Around the time of OMD relaunching, the band had begun to engage the services of Hambi Haralambous for video services. Hambi had carved out his own musical career in the early Liverpool music scene via outfits such as Hambi And The Dance and Tontrix, but would later work with OMD directly due to his connection with the Motor Museum studio. Hambi had later decided to switch his focus from music to video, which resulted in the elaborate video backdrops that accompany much of OMD’s live performances. Hambi had also been instrumental in the creation of The Energy Suite – an idea that embraced the combination of music and video. Subsequently Hambi took on a more hands-on role for filming OMD performances, particularly the filming of the Royal Liverpool Philharmonic Orchestra performance in 2009 – a combination of a live rendition of The Energy Suite as well as a special OMD concert featuring orchestral arrangements of many classic songs. Hambi’s talents were also brought onboard for the Museum Of Liverpool show in 2014. Shooting a concert within such a venue offered up its own challenges. The narrow confines of the foyer, plus the spiral walkways had meant that the planning of the shoot had to be quite meticulous. It also involved some unusual approaches, including hand-held cameras roaming in the audience. The preview clip on the PledgeMusic website shows a very crisp image and tight editing with excellent sound (a world away from the low-res shots that some attendees still insisted on shooting on their mobiles!). To launch the Museum Of Liverpool DVD, the band turned to crowdsourcing venture PledgeMusic (through which the likes of Erasure and Echo & The Bunnymen had also financed successful projects). 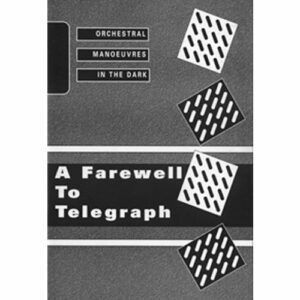 Similar to the Live In Berlin release, the DVD was envisioned as a hardback book, which would contain not only the footage of the concert, but also bonus footage of the post-show Q&A and the making of the Dazzle Ships installation piece. 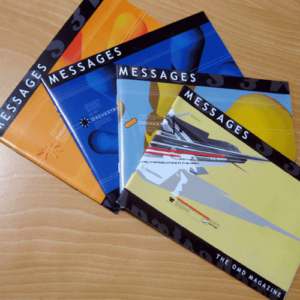 To complete the package, an audio CD of the concert complete with the ‘lost’ OMD tracks ‘Dazzle Ships (Parts I, IV, V & VI)’ was commissioned. To accompany the launch, a series of limited edition bonus items were also made available for sale. 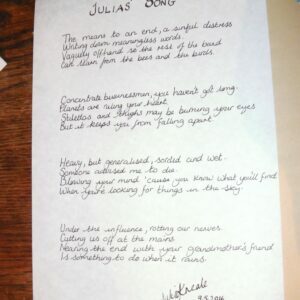 These included signed copies of the DVD, handwritten lyric sheets, some of the semaphore flags used during the actual performances and even the actual tape reel used by Winston during the show. All of these exclusives were, naturally, snapped up quite rapidly. Plans for further exclusives and merchandise have also been announced (the most recent of which was a special T-Shirt). 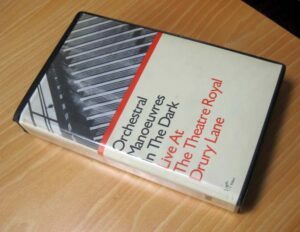 Keeping a video record of these unique moments in OMD’s history is quite important (Imagine footage from the band’s post-Dazzle Ships tour at the likes of the Hacienda turning up for instance). So the DVD release of the Museum Of Liverpool performance means that some of the qualities of that special weekend can be captured as an historical archive – as well as a reminder of a fantastic weekend. 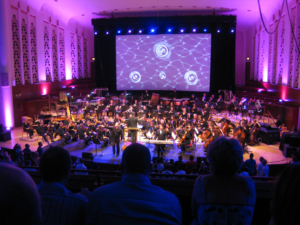 DVD: Footage of the Museum Of Liverpool concert (unclear on which day is being used, or if a combo of both), behind the scenes footage including the aftershow Q&A, creating of the Dazzle Ships installation piece and a short Dazzle Ship film (PAL format). 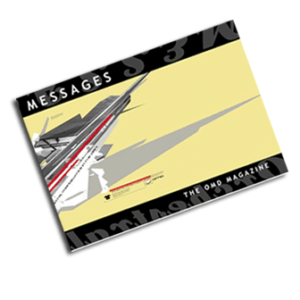 CD: Audio recording of the concert, plus the tracks ‘Dazzle Ships (Parts I, IV, V & VI)’.